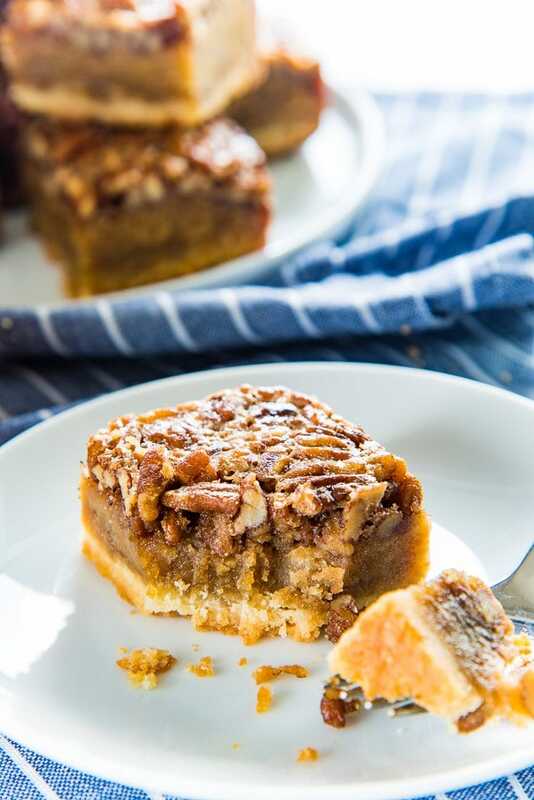 A decadent and fudgy butterscotch filling between a crunchy, chewy topping and a flaky, buttery shortbread crust – these Fudgy Pecan Pie Bars are PERFECT as a Thanksgiving dessert or for any time of the year! 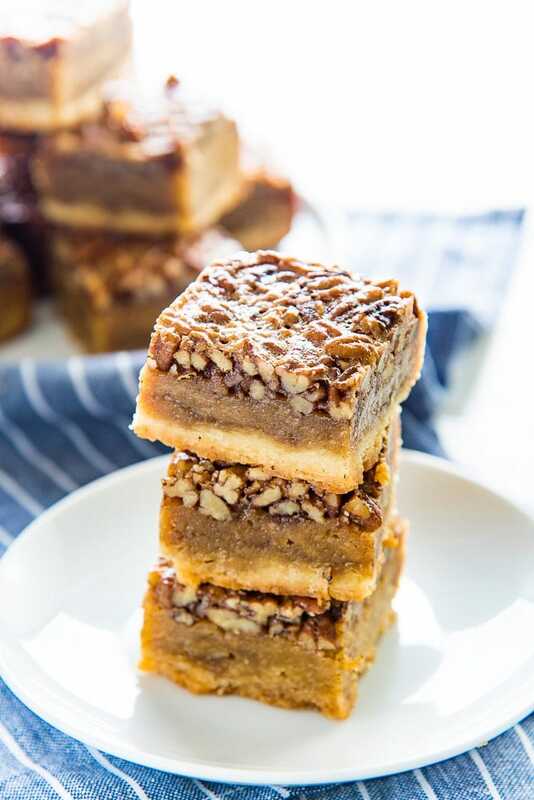 And if you’re worried about making a classic pecan pie with a finicky pie crust, then these super easy pecan pie bars are the perfect solution! Pecan pies are always a safe bet for holiday entertaining, because everyone adores pecan pies! A decadent, delicious, gooey filling, with a crunchy topping, and a buttery, flaky crust… what’s not to love? My husband is the same, and it’s the reason why I taught myself how to make a classic pecan pie. But first I started with these deliciously Fudgy Pecan Pie Bars, perfect for holiday entertaining and a great alternative to pumpkin pie for Thanksgiving too (or you can make them both, of course!). Plus, the serving size is smaller with these fudgy pecan pie bars, so it’s easier for portion controlling too. But admittedly, it’ll require considerable will power, because these babies are just so addictive. The shortbread layer and the pecan filling are so easy to make, and these really are a great Thanksgiving dessert. 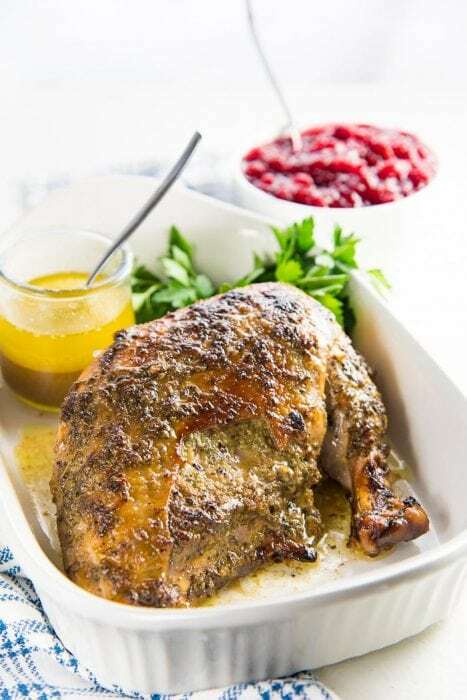 If you’re serving a large crowd, you can easily adapt this recipe for a 9 x 13 inch pan as well. Shortbread crust dough, dolloped into the pan so that it’s easier to spread. This is very easy. I prefer a more buttery shortbread crust for these fudgy pecan pie bars, and I add less flour, which makes the crust softer than a typical pie crust. Since the base is soft, you will need to press the dough into the baking pan and make sure it’s nice and even. Then refrigerate to let the crust set and become firm. The crust will hold its shape better while being baked, if it has been chilled first. 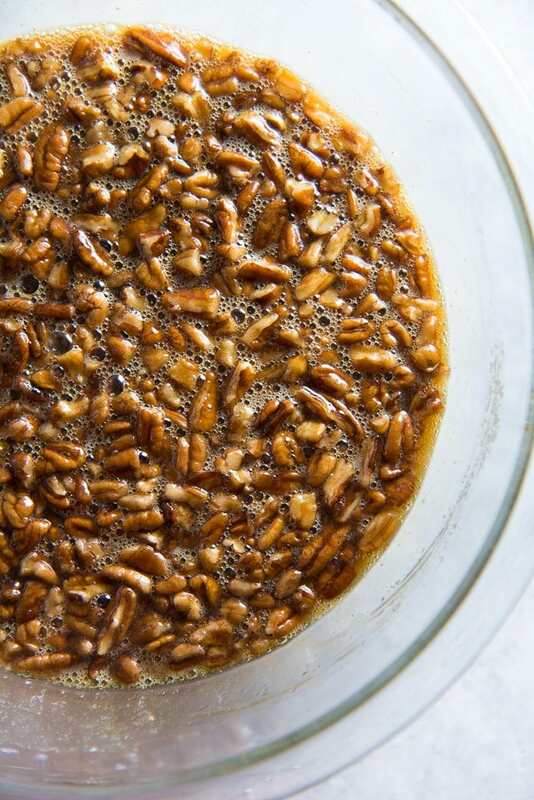 Even the fudgy pecan pie filling comes together quickly. I like to use chopped pecan nuts for the filling, for two simple reasons. Chopped pecan nuts are a little cheaper than half pecan pieces. This way you get more pecans in your fudgy pecan pie bars! Another great way to add even more flavor to these fudgy pecan pie bars (or even a classic pecan pie) is to roast the pecan nuts in the oven first for a few minutes. 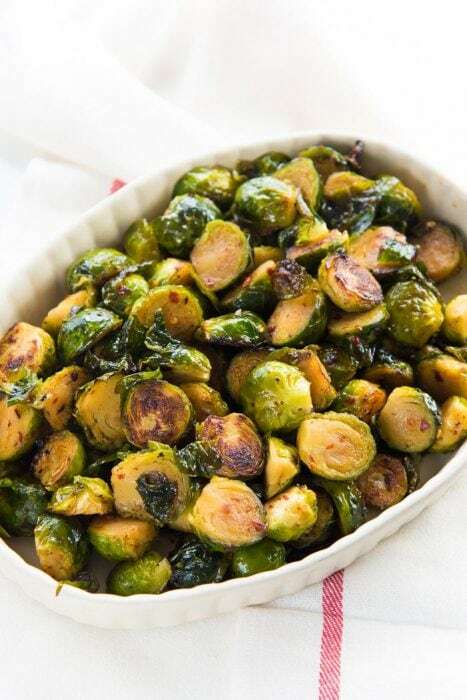 Or you can roast them in a pan on the stove top as well if that’s easier. The filling in these pecan pie bars is exactly like what you’d expect in a classic pecan pie. 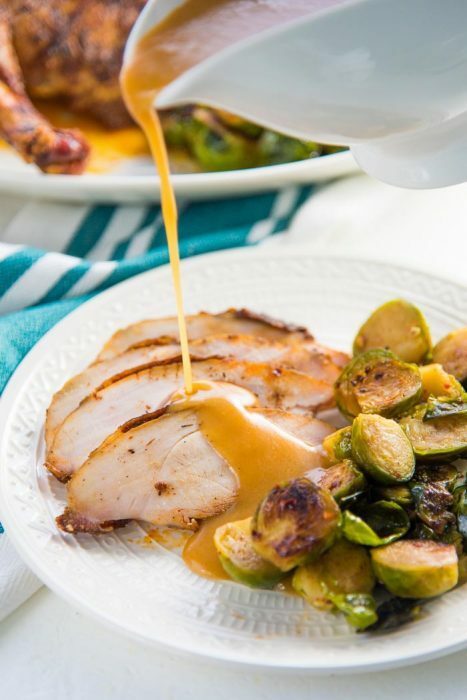 You get the delicious butterscotch flavors from brown sugar, butter and vanilla, as well as the nutty flavor of toasted pecans. 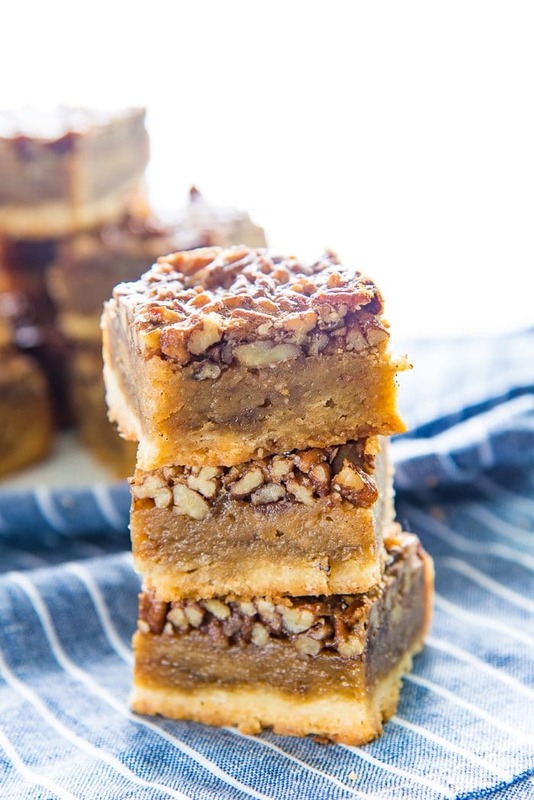 As these fudgy pecan pie bars bake, the pecan nuts move to the top creating a nutty, crunchy, chunky pecan layer, while the butterscotch, butter and eggs create a decadent and fudgy caramel layer between the pecans and the flaky shortbread crust. So do you need another excuse to make these irresistibly fudgy pecan pie bars? 🙂 These were my stepping stone to making classic pecan pies, so if you’re worried about making a classic pecan pie, then these fudgy pecan pie bars are the PERFECT solution! 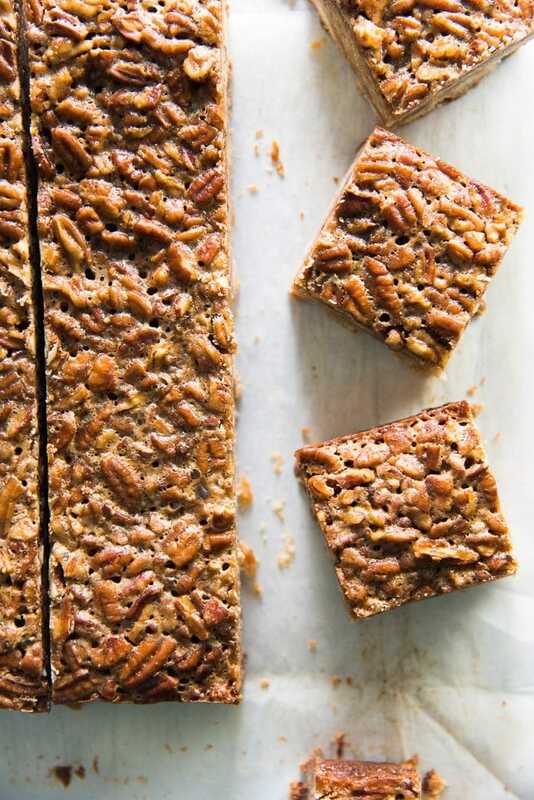 Your friends and family are guaranteed to go pecans for these bars! 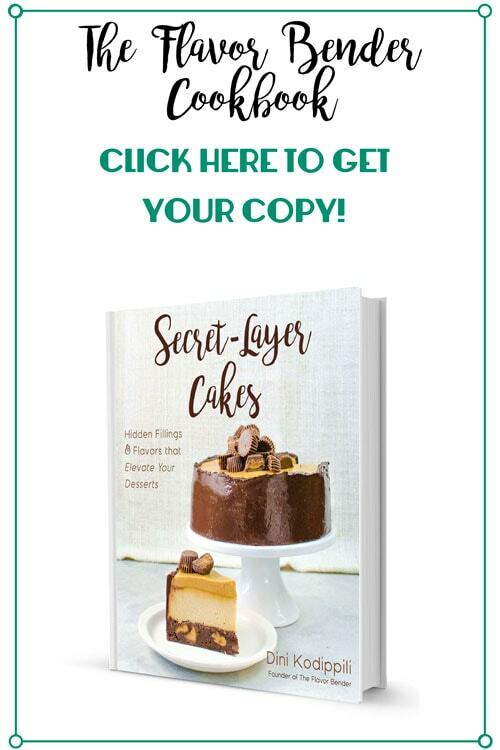 If you liked this fudgy pecan pie bars recipe, don’t forget to subscribe for new (and free) recipes by entering your email address on the side bar (and get all these recipes delivered straight to your inbox), so you don’t miss out on a thing. You can find me on FACEBOOK, TWITTER, INSTAGRAM, PINTEREST, YOU TUBE and GOOGLE-PLUS too. Whisks – A good set of whisks is a must for all of your baking needs. 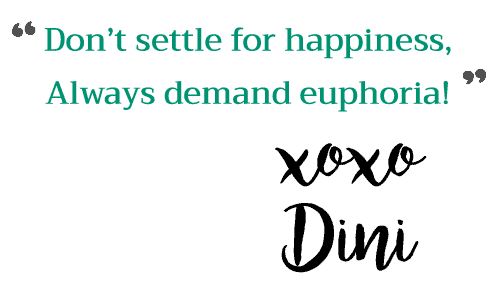 8 x 8 inch baking pan – I use this pan to make these BEST FUDGY BROWNIES and blondies as well. I have 3 of these in my kitchen and love them. Here’s a cheaper (but great) option as well. Quarter sheet pan – Another essential tool for a baker. I used this to toast the pecans in this recipe. 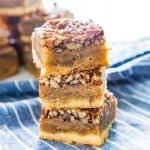 Fudgy Pecan Pie Bars - Classic pecan pies in the form of a bar or slice! A buttery shortbread crust and a fudgy flavorful pecan pie layer. 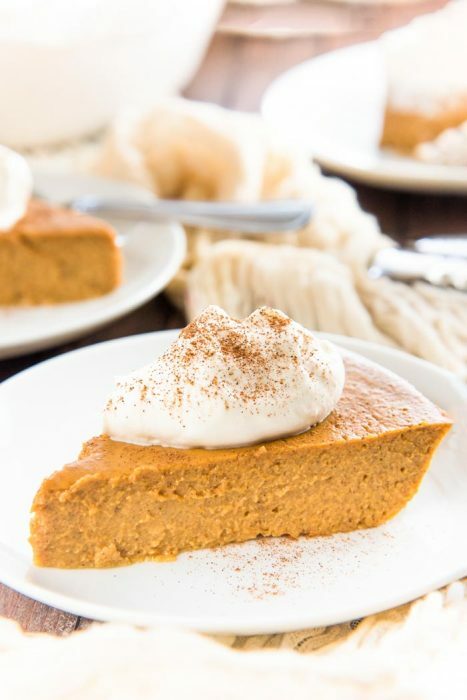 A decadent and easy Thanksgiving dessert, or for any time of the year! Line an 8 x 8 inch pan with parchment paper (I line the whole pan with parchment paper to prevent the pecan pie filling from sticking to the sides). Set aside. Place the butter, sugar and salt in a bowl, and using a hand mixer (or whisk), cream everything together until light and fluffy. Add the flour and stir in until mixed in with the butter and sugar. 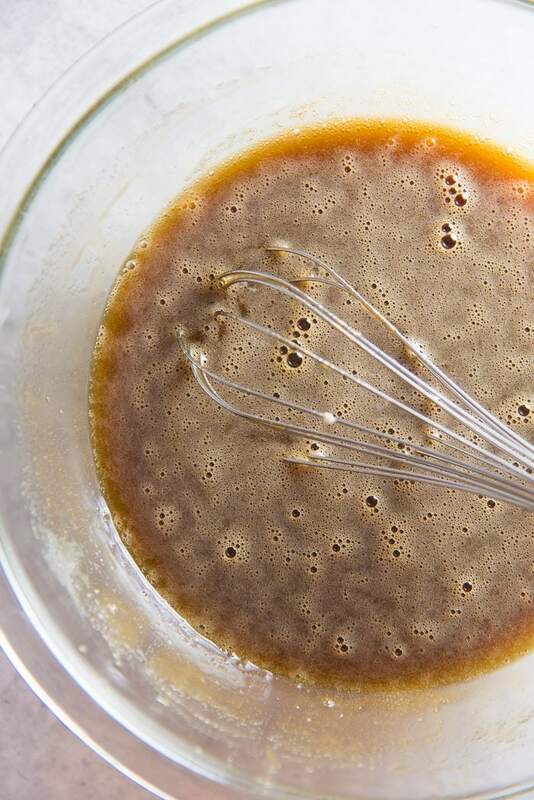 Stir to form a very sticky and soft dough. 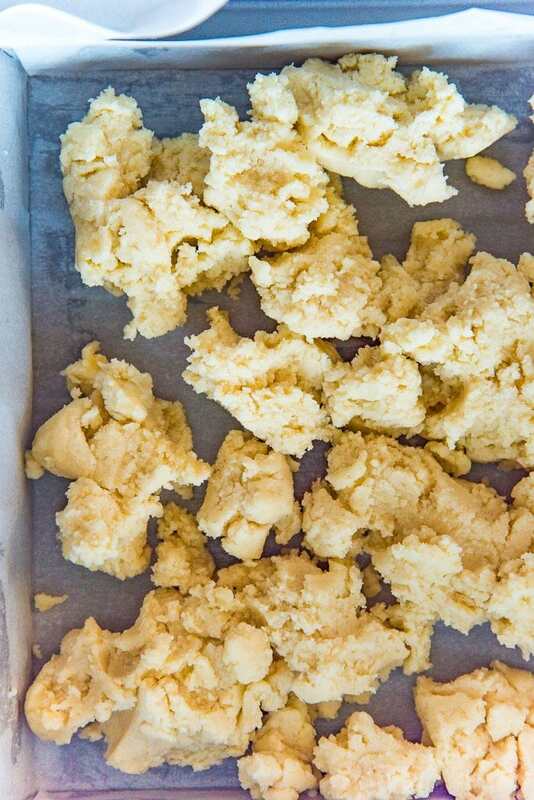 Dollop the shortbread crust dough into the parchment paper-lined pan, and spread the dough evenly on the bottom of the pan. Be gentle and careful since the dough is soft and sticky. 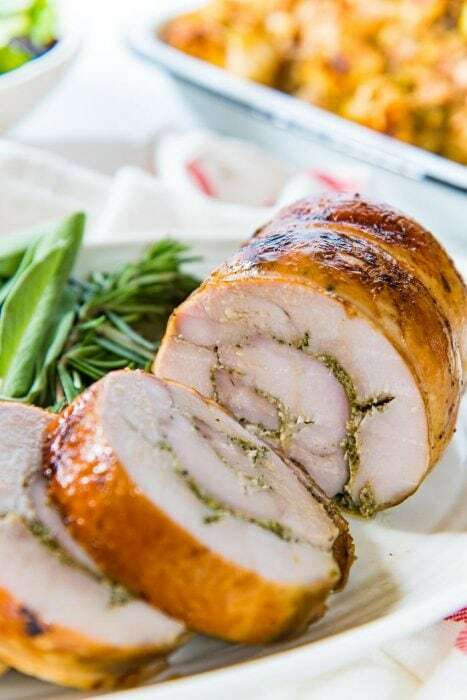 You can use the back of a spoon to spread it, and then an extra piece of parchment paper to evenly smooth out the crust. Refrigerate the pan for about 30 minutes to let the crust set and become firm. Preheat oven to 350°F, while the pan is chilling in the fridge. 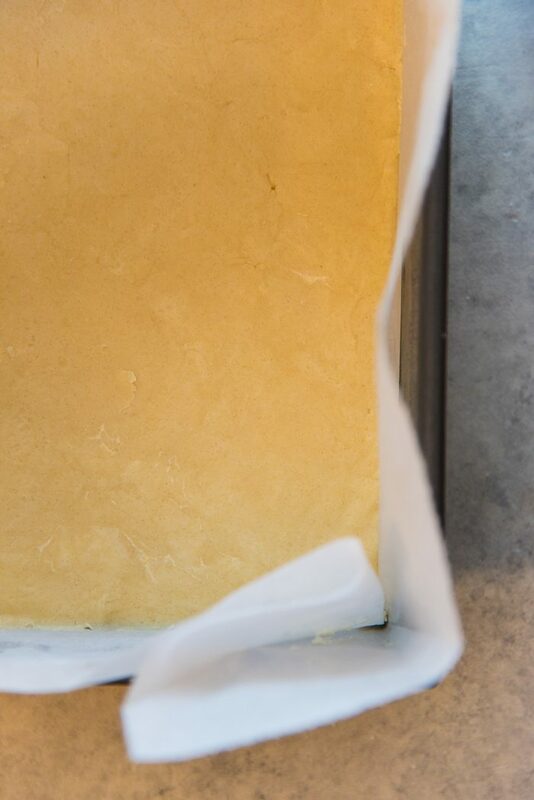 When the crust is chilled and the oven is preheated, bake the crust in the oven for about 20 - 30 minutes - just until the edges of the shortbread crust start to turn golden brown. Then remove from the oven. While the shortbread crust is baking, start making the pecan pie filling. 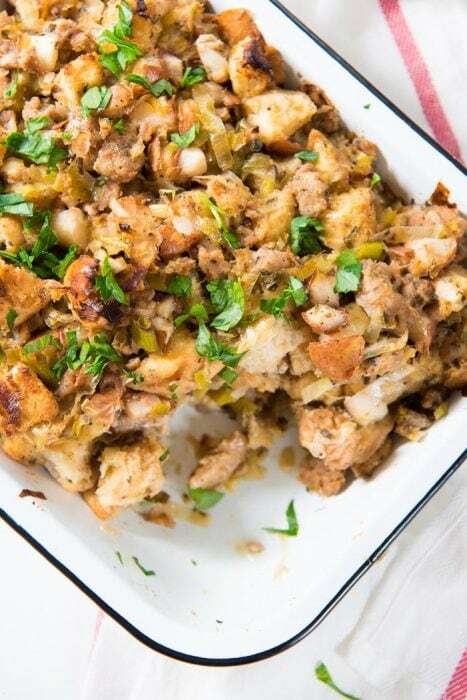 OPTIONAL - place the chopped pecans in a baking tray, and toast in preheated oven for about 5 - 10 minutes (i.e. while the shortbread crust is baking as well). The pecans should be toasty, but not burnt, so keep an eye on them. Remove from the oven and set aside until needed. 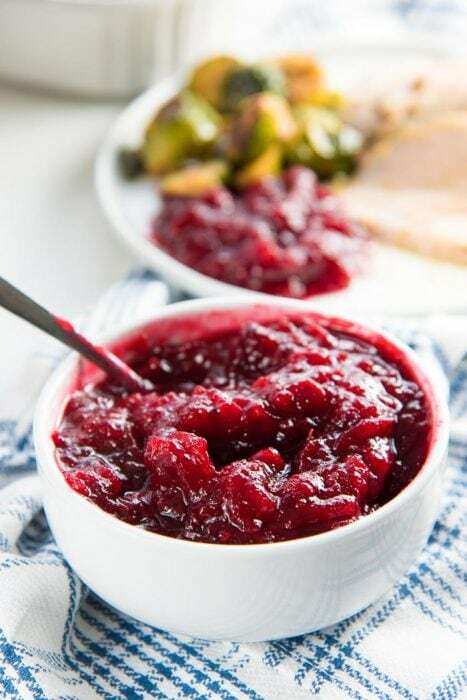 Place the brown sugar, maple syrup, butter and salt in a saucepan or microwave-safe bowl. Heat over medium heat and stir frequently until the sugar has completely dissolved and the butter has melted. You can heat and melt the sugar in the microwave as well. When the sugar has melted, remove the pan from the heat and allow to cool for a few minutes. In a separate bowl - whisk the 3 eggs and vanilla together until well mixed. 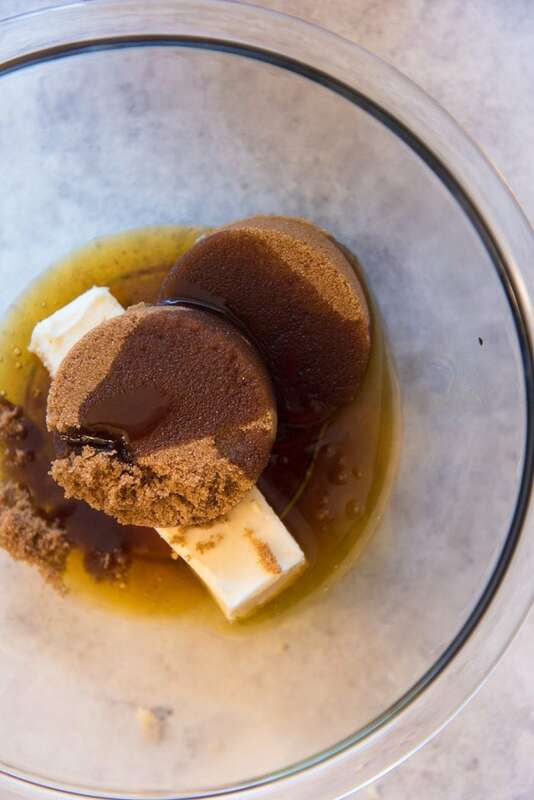 While whisking the eggs, pour the sugar-butter mix into the egg mix. Once the sugar-butter and egg mix are thoroughly mixed, stir in the chopped nuts (toasted or not toasted). Pour the pecan pie filling over baked shortbread crust. 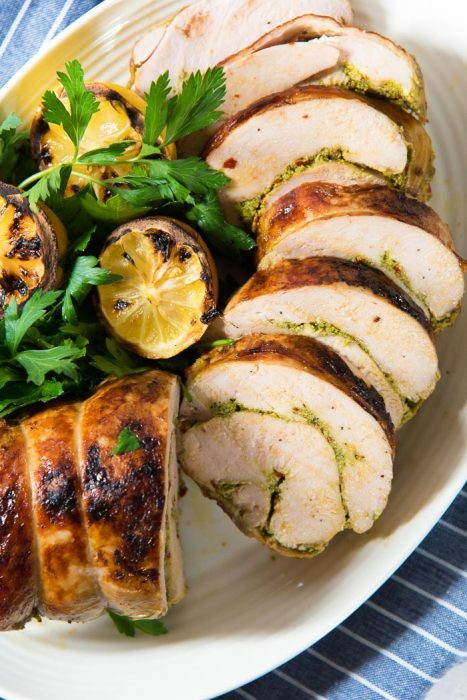 Return the pan to the oven and bake for a further 30 - 40 minutes. The filling should be set around the edges, but slightly jiggly in the middle (not runny). Remove the pecan pie slice from the oven, and let it cool down completely in the pan. Loosen the pecan pie slice from the pan, and let it chill completely in the fridge overnight, covered in plastic wrap (you can leave it in the pan, OR transfer it to a different tray). 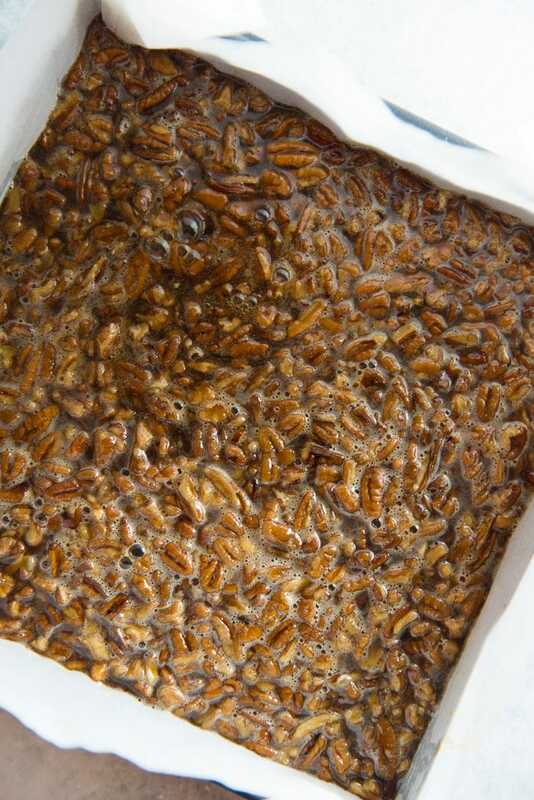 The following day - remove the whole pecan pie slice from the pan, and cut into squares/bars, using a sharp knife. You can cut it into 16, 2 x 2 inch pieces, or 25, 1.5 x 1.5 inch pieces. Store the pecan pie bars in an airtight container, in the fridge. Serve at room temperature. I am embarrassed to admit how many I ate….well actually I don’t know! I stopped counting after number 3!